TLW: So how's retirement treating you, what are you up to these days? DT: I'm doing bits and bobs, keeping myself busy. I'm not in football at the moment but I'm involved with businesses on a day to day basis. I do miss football and I do want to get back into it at some stage. It's my life and my area of expertise, and ultimately that's where I need to be. TLW: So what's retirement like then, taking into account the level of discipline you need to have as a professional footballer, such as diet, sleeping training etc what's it like to then not have to do that anymore? DT: People think that you'd have had enough of it and wouldn't want to do it anymore, but actually your body and your mind need to keep up that discipline and you need to feel that level of fatigue. I found for two or three years that I was in the gym every day. I couldn't understand it, but I'd wake up every Saturday and my heart rate would be through the roof! Your body is used to it being Saturday and the adrenaline is pumping. I couldn't understand at first why I was always so agitated on a Saturday, I'd go for a walk with the family and stuff and I'd just be feeling really agitated and couldn't get my head around why that was. When you've been doing it for 17-18 years, it's not going to subside as Saturday is an exciting time, you start preparing for the Saturday on the Thursday. That's the routine you're in, you start getting excited and looking forward to it, and for it then just to stop….. it does take a lot of getting used to. I still don't think I'm used to it now, I wake up and I miss it. I'm devastated that I'm out of the game and had to retire so early. Even though I had a long time to get my head around it as I knew my knee was going to make me have to retire, it still came as a shock the day I thought "I can't do it anymore" It was a sickening moment for me because I was doing the job that I loved and I'd always wanted to do. Then all of a sudden you can't do it anymore. TLW: You mention you want to get back into the game, what role do you want to have? Is it more managerial or coaching? DT: I took my badges two years ago and I got my A licence, but I actually don't really enjoy the coaching side of it. I see myself as more of a mentor, a managerial type. That's what I see my future as, there are coaches out there who would be far better than me as they really want to be coaches. I don't want to be a coach. I like improving people, pointing out their weaknesses, telling them where they are going wrong and pointing them in the right direction and helping them improve based on your own experiences. I like tactics and strategy, shifting the balance of play, I'd like to be responsible for all of that. Sometimes as a coach you don't get the recognition, and being such a competitive person I feel you do need the reward and the pat on the back. TLW: So that sounds like maybe you'd be suited to managing in youth or reserve team football? DT: Definitely that's the place I need to start if I'm going to get back into it. Those age groups look up to your experience, they look at how many appearances you made and what you did in the game and they respect that. Sometimes for younger players if you've got a coach who's never been there and never done it, it can be difficult listening to him and taking advice from him. Kids nowadays often think they've made it before they've made it. So that's where I'd want to start at some point. There's got to be an end point, and with the youth and reserve teams the end point is to get players through but I'd like to be successful and to be recognised not just for bringing players through but for winning trophies and getting results. It's difficult getting back in having been out of it for so long though. TLW: So let's go back to the beginning, tell us how you came to be at Liverpool. DT: When I was about 8 or 9 my dad said to me that there was a coaching course going on in Liverpool and would I like to go and do it. I think it was about £45 at the time, which was quite a lot of money for my dad to pay. He paid it though and I got on the course and did very well. It was fortunate because a couple of the Liverpool youth coaches were taking the sessions. I'm not sure whether Jamie Carragher was already on Liverpool's books or not, but he was on the same course and myself and Jamie both did really well. Hughie McCauley asked us to come down and the rest is history as they say. It was a great opportunity for us because even though you might be a good player you worry about whether you'll get spotted. I was very lucky to be spotted at 8 or 9 and then coached in the Liverpool Way for such a long time. 12 years I was at the club learning to play the Liverpool Way, which was a fantastic coaching education as they were exceptional coaches. 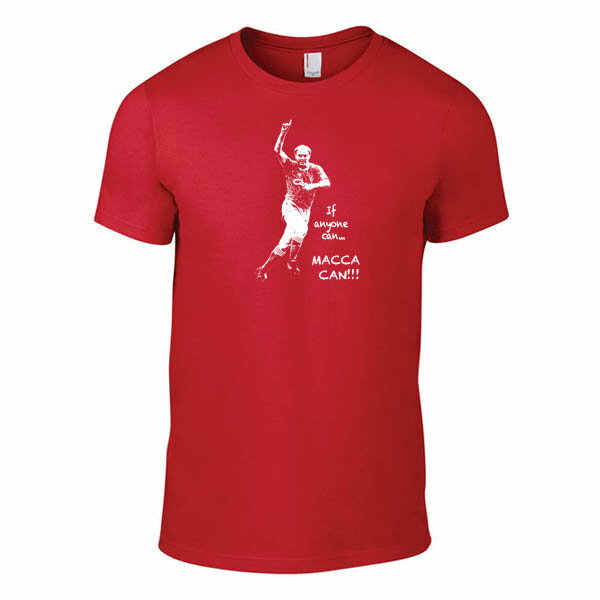 TLW: It's well known that Jamie Carragher used to be a striker back then. That's difficult for some of us to imagine having only seen him playing in defensive roles. You started at the same time as him, so what was he like? 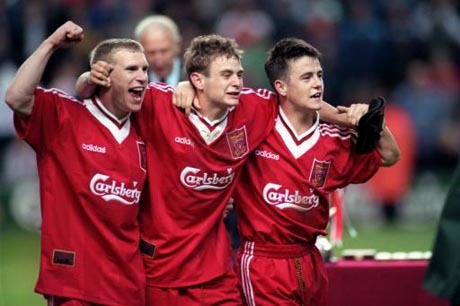 DT: You know what, when Carra was a young lad he was a fantastic striker. He had pace, awareness, he'd make good runs and his touch and control were fantastic. He could play anywhere though and he has done for Liverpool. He's got such a good football brain and he's been so well educated at Liverpool for a long period of time that he knows the game inside out, he knows the positions and what's required. He's a completely different player now than he was then, but what Jamie does is he reads the game very well and knows the game inside out. His positional awareness is fantastic. I know he doesn't have the pace that he used to have but his awareness and reading of the game is second to none. I've seen him play right back and do very well, I've seen him play left and mark world class players out of the game, he's been exceptional at centre half, I've seen him holding midfield, up front and right midfield and he's done very well every time, he never lets the side down. Liverpool miss him when he isn't there, I mean look at the Southampton game last Saturday. There was no organisation in the back four, they were all over the place and sixes and sevens and they got beat. That's no co-incidence. TLW: Going back to your youth days, you mentioned Jamie Carragher and you also played with Michael Owen and had FA Youth Cup success. What was that like? DT: It was good. 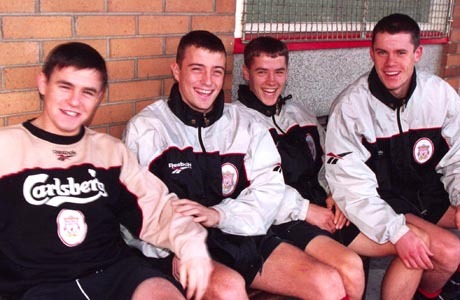 Our youth team was fortunate to have players like Michael Owen, Jamie and myself as we were all good players, but we had a good mix in that team. We were very aggressive, determined, hungry lads. I remember we went to West Ham in the first leg of the final without Michael and they played us off the park. Rio (Ferdinand) was spraying it everywhere, Frank (Lampard) was running around doing his thing, but we won. And come the second leg at Anfield it was a different story, we were strong, closing people down, getting in their faces and we passed it. It was a good balance, and good times. Even at that stage Michael was a bit special, he was only 16 but he was scoring all the goals. Yeah he was certainly a bit special. 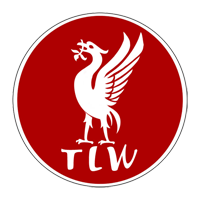 TLW: You've been involved in a few, shall we say, skirmishes, do you think it's unfair that some people maybe remember you for the competitive nature of your game rather than your ability, because you could certainly play. DT: If people saw me that way then yeah I do think it's unfair. Don't get me wrong, I was determined and I was aggressive, but I knew I could play a bit. My assists and my goal ratio was always up there, but when you're small and lightweight you've got to get stuck in. You have to set your stall out early in games and that's what I always tried to do. Try to intimidate the opposition, intimidate your direct opponent to let him know that he's not going to be in for an easy game. And if he thinks he's going to try and wind you up or rattle you he's going to be wasting his time. You want to put him on the back foot from the get go and that's what I always tried to do. I was physical but I was never nasty. I always tried to play the ball first and be tough, be first to the ball. TLW: We have to talk about, shall we call it an 'unfortunate incident'? DT: The incident you're talking about wouldn't be with David Hopkin in a reserve game with Leeds United would it? Is that the one? The referee played on and I just wasn't going to stand for it. So I jumped up and ran about 15-20 yards to confront him. As I was getting up there - 15-20 yards is a long way! - and when I got up there I realised he's a big, strong lad, and I'm thinking "What am I gonna do now?" I've got friends and family in the crowd, you want to look like a bit of a tough guy and well… I've thrown a couple of punches, a couple of kicks and *laughs* well it just a very unfortunate incident! I wouldn't change it though, that's just the way I was. I wasn't going to stand for anyone trying to bully me or intimidate me. People had to drag me off as I was trying to get back at him, but sometimes when that red mist comes down you just can't control yourself. Even as a young kid that was in me, I wasn't going to be mugged off. It's part of what made me who I was and I'd even try to get that message across to kids now. You watch games on the park and there's teams trying to intimidate lads by their body language and aggressive nature. You just can't let that happen, you've got to stand up to it and be strong. Although obviously I could have handled that situation a lot better! It cost me though, I was banished to train at the Academy for two weeks! Gerard Houllier said I was a thug. I don't believe I was a thug, I was just reacting to something that was very dangerous and could have ended my career, and I wasn't going to tolerate that. TLW: So when people talk about Luis Suarez's niggly side, is that something you can relate to as he does get kicked an awful lot? DT: Yeah he does, but to be fair to the lad he gets up and he has a certain level of control. I've got a lot of time and respect for Luis Suarez. He's a small, slight player who does get kicked a lot but he gets up and gets on with it. The best in the world for that is Lionel Messi. How many times do you see him get smashed but he just picks himself up, dusts himself down and carries on. He never reacts and never gets a yellow card. He does his damage with the ball, and I think Suarez is the same. There's players who handle it in different ways, but I like the edginess Suarez has and everything that he's about. 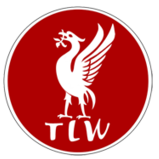 TLW: Tell us about your relationship with Gerard Houllier, as it wasn't always smooth was it? DT: It started off quite well. When he first came to Liverpool I think he liked me. He liked what he saw, the hunger and desire. But I was maybe too young, too hungry and headstrong. I think he could have handled me better than he did really. The language barrier made it difficult I think. I was slightly immature and he could have handled that better and maybe we'd have got on. In the end we didn't really see eye to eye. There was another occasion when I was sent off for the reserves playing at Blackburn. At half time he went into the showers and he's shouting and screaming about me. In frustration I kicked a drinks bottle towards the showers, and low and behold he came walking out at that exact moment and it hit him in the chest! It was the best pass I'd made all night by the way! But that was the end for me at Liverpool really. TLW: Would you say that put you in a situation where you had to go? DT: It did, but that season was my best up to that point. I'd played around 35 games, scored three or four goals and had plenty of assists, my performance level was on the up and as a young lad maybe he should have handled me a bit better. Then he went out and signed Nick Barmby for £6m. I thought to myself "You're signing that player for £6m, he's going to be in my position so I'm going to have to sit on the sidelines again for another year". I was that confident in my own ability at that time that I knew I could play in the Premier League. So we had a meeting, me and Gerard, and I said I wanted to know if anyone came in for me. Two days later Coventry came in and I decided to go for it. It was an opportunity to play. It could have been anyone at that time and I'd have gone. I wish now that I hadn't been so headstrong and I wish people around me would have said to me 'don't be hasty, this is Liverpool Football Club, take your time'. I was just so hungry to play and so determined to prove myself that I wanted to go and to be appreciated somewhere. TLW: What was your best memory about being a Liverpool player? DT: Making my debut and just being around a club like that really. Just getting on the coach and arriving at Anfield for games, the atmosphere was electric. I remember my debut, the Kop singing away… they start chanting your name and the hairs on the back of your neck stand on end. The adrenaline is pumping through your body and it's an unbelievable experience for a local lad. It's a feeling that you can never replace. 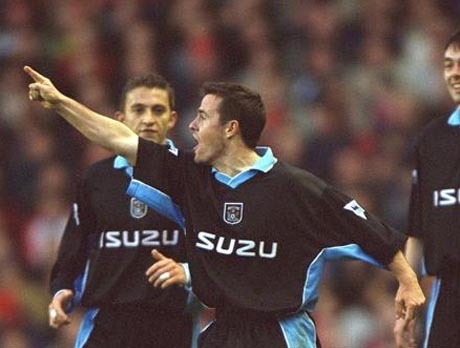 TLW: Your best goal at Anfield actually came against Liverpool when you came back with Coventry. DT: *laughs* Yeah. Stevie G gave the ball away in midfield, I'm not sure he realised I was playing in a Coventry kit but he gave the ball straight to me! I remember picking it up in the centre circle and jinking past Gary McCallister. I was really tired actually, I was about 40 yards from goal and I thought "I could carry this a few more yards and maybe try and beat someone else" but I was so tired I decided to just smash it and see what happens. So I just smashed it from about 35 yards and it flew into the top corner. It was a hell of a strike! I'd said that I wasn't going to celebrate but it was such an unbelievable goal and I had a lot of frustration in me and after the celebration I did direct a gesture towards Gerard Houllier which I do regret, but at that moment in time the adrenaline and rush of blood just goes to your head. I still had a lot of respect for Gerard, I was just frustrated at the way he handled me. I saw how he handled other players and just wished he'd handled me as well as he did them. We are individuals and everybody is different. I needed educating at that time to fit into the continental style he was bringing in. I was just a kid who'd been brought up trying to fit into the 'Liverpool Way' of doing things, so it was a change for me and I needed educating. If Roy Evans had remained in charge my career may have really blossomed and I might have been there for a long time, you just never know. I think Gerard got my hunger and anger and desire to be a first team player a little bit distorted and it clouded his view of me. I think I was slightly misunderstood. TLW: You went to Blackburn and earned an England call up, but unfortunately you were never able to play. DT: Yeah that was very frustrating. Having made the move to Blackburn I was really enjoying my football and going onto the pitch with a real confidence that I'd make an impact. I felt fit, I felt strong, everything that I'd been working on was starting to come together; left foot was improving, right foot was improving, I was scoring goals, getting assists… when you're getting recognition form your team-mates as well for being an important part of the team, it gives you a lot of confidence and I was taking that onto the pitch. I was never worried about who I was playing, I always felt they should be worried about playing against me. Things were going really good, so to get the England call up and then have my knee blow up like it did on the first day's training was a very frustrating moment for me. You feel like you're there on merit, you've been selected as one of the best players in the country and that you can do a job for your country. I felt I could do a job at that time but my knee reacted and that was the beginning of a major problem for me. It never got any better, it was a degenerative condition and that's what frustrates me most, I never got to completely fulfil my potential and I never knew how far I could actually go. That's frustrating but on the flip side of that you get people who get knee injuries at a young age and never even get on the ladder. So I have to day I was very lucky, I had a good career, one that I'm very proud of but you just have to get on with it and deal with that. I thought I could come back from the injury as I was so determined and such a hard worker. I felt that it was people who didn't put the effort in that didn't get the rewards, and my effort level went up twofold but my performance level went down by half every time. I was working harder for less reward and less recognition, and I could never reach the levels I had before in terms of fitness, in terms of recovery and in terms of performance, it was very frustrating. 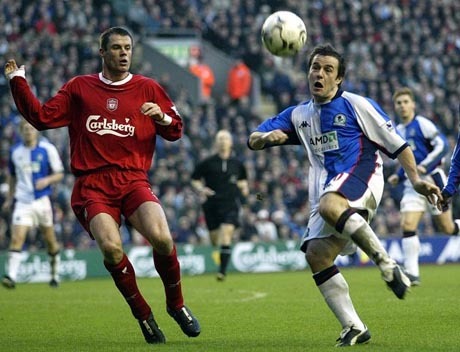 TLW: Obviously making the decision to retire is the hardest thing for any footballer, what do you make of Jamie Carragher's decision to call time on his career? DT: I think it's premature. Knowing Jamie, he's a very proud man and he will have looked at how he's been used this season and thought "I want to play every game". Jamie's performance levels this season have been fantastic. His reading of the game is second to none. After games he probably can't get up the stairs, he probably feels very stiff, very sore. But I'm sure Ryan Giggs at 40 years of age also feels stiff and sore after games. You just manage it. I know he's probably got opportunities to do media work and maybe an opportunity to stay on at Liverpool in some staff capacity but if he can still run and he can still play and affect the team and his team-mates around him then I would encourage him to play on for as long as he can. TLW: What made you eventually make the decision to call it a day? DT: My performance levels had really dipped and I was at the end of a contract with a club. The contract offers were getting less and less, and even though Bolton had offered me a pay as you play deal I felt like I was going to be taking money under false pretences. I felt like I was going to take the money and not be able to perform to the level that I felt was required for that team, so I felt like a bit of a fraud and didn't want to take their money. So I thought "enough is enough, let someone else have a go". I probably could have played at some level for another two years and I do regret not doing it though. I'd always encourage people to keep playing. If you can run and have no physical disability, just keep going as long as you can because there's a lot of enjoyment to be had and a lot of satisfaction You never know what's around the corner." TLW: What do you make of Liverpool under Brendan Rodgers? DT: If you'd have asked me six weeks ago I'd have probably been very negative. I kept hearing about this new philosophy and this new transition period and this that and the other. It was getting a bit frustrating, how many managers have we heard talk about transition periods and it taking time for their philosophy to bed in. But I think now the players are starting to accept Brendan Rodgers' philosophy of passing football and quick movement. But this 'transition period', you can't keep buying youngsters and then wait for them to come good, you've got to bring in players that can hit the ground running as well. The likes of Coutinho is a great example of what can be done, ok he's young but he can contribute immediately and he's done very well. That's what needs to be done in the summer, get players that are ready to make an impact now, not in a couple of years. There's a couple of players that Brendan bought that have taken a little while to get going. These people have got to realise the opportunity that has been given to them. You're playing for Liverpool Football Club and you've got to give absolutely everything because you never know how long it's going to be there.